I have been on a fast track build for my 2011 Kawasaki Teryx. Phase One was completed just in time to got toMoab for Rally on the Rocks in May. 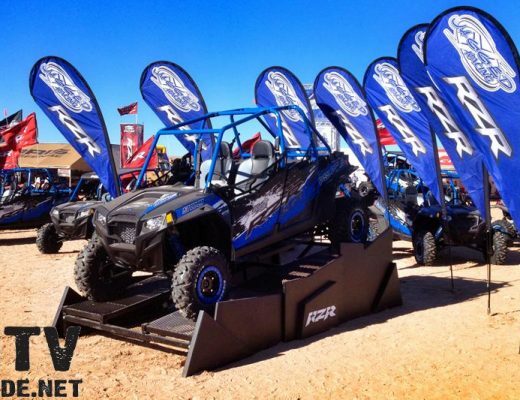 The Teryx performed beyond my expectations and I was eager to get some more riding in, and continue with the buildup. First-up on my agenda was bigger tires and wheels. I have been watching with interest as people have put light truck tires on their UTVs. The build that pushed me over the top wasJagged X’s Polaris RZR XP desert race car with 30″ BF Goodrich Mud Terrain KM2s on it. One of the issues with LT tires, is stepping up to a 15″ wheel. 12″ and 14″ wheels are much more prevalent and beadlocks are only available as a custom made item. I have been a huge fan ofOMF Performance Billet Center Beadlock wheels, and decided that I would see if they could build a set in a 15″. After talking with Bones @ OMF, the answer was yes, but it will take us a few weeks to get the design sorted out. With the wheel choice in hand, I set about looking into tires. I have been using a 26.5″ Rocker ATV/UTV tire with great success, so I decided to talk with Mike at Pit Bull Tires to see what he thought. Their smallest LT tire is a31X1150-15LT Growler. This was a little bigger than I wanted, but I decided to give them a try. With the new tires and wheels all mounted up on my Teryx, I had the itch bad to try them out in the rocks. I twisted my buddy Dave’s arm to head up to the Rubicon for a quick day trip so I could test some new tires and wheels on my Teryx. For those of you that have met Dave, you know the arm twisting is a bit of a stretch. Dave is pretty much up for anything. He has a 2011 Polaris RZR XP with a set of Pro Armor doors and a set of 26.5″ Pit Bull Rocker tires and loves to play in the rocks. We decided to park at Loon Lake and head in towards Little Sluice. It was a Sunday, so I knew we would be fighting upstream against the 4×4’s coming out from their weekend, but we weren’t on any strict schedule and knew we could turn around at any point in time if necessary. Once we hit the trail, it took a little bit to get used to being higher in the air. The tires are huge, and weigh 10+ lbs. more each than what I had on there before, but even with the stock engine, I was able to move along without too much effort. Clutching was off a bit, but I have a Dalton adjustable clutch and that will be tailored to the big meat this week. Rocks that I used to have to put a tire on to get by, were now passing effortlessly under my Factory UTV UHMW skid plate. My Teryx was transformed into a mini rock buggy! With the huge amount of rubber under my Teryx, the Wicked Bilt power steering I had installed was now more important than ever. Steering was firm, but easy to use. 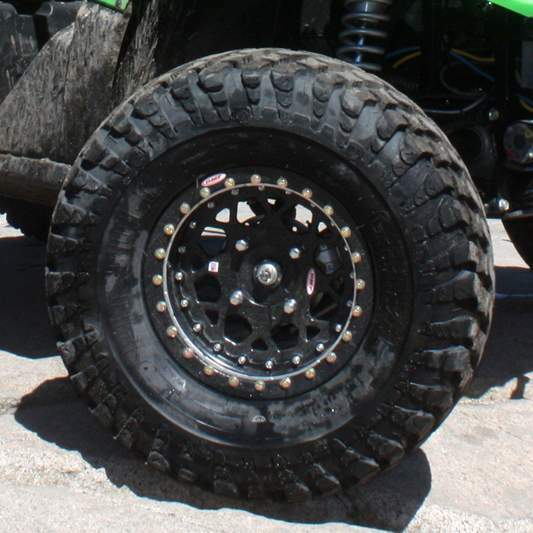 I recommend power steering in general on any UTV, but with this much tire, it is a necessity. 31″ tires are a little larger than I had in mind for overall use, but for the rocks I am a huge fan. I do have a few clearance issues than I need to work on with tires hitting plastic, and I am not so sure I would use a 31″ tire for desert (especially without trimming even more plastic). Phase Two our of buildup is underway as I type. Big tires and wheels were the first step, and with this trip I know what to adjust with the Dalton clutch kit. But the even bigger part of this phase is more power. Just last night, a crate showed up with a new 916cc Muzzys engine. The swap will start today, and I hope to have it ready for a longer trip to the Rubicon next week!